Almost all of us, sometime or the other in our life, have gone through the experience of feeling that somebody is following or watching us. Whether it is a human being or an animal but it makes us turn our neck to see what it is and investigate. Similarly there have been innumerable instances where people and animals have sensed danger much before it strikes them. What is the nature of the signal that tells our mind that somebody is watching us or there is a lurking danger and how is that signal generated and sent from the pursuer's brain? In other words what is thought and how is it generated and transmitted? human thought. The religious writings are basically a discussion on it. The greatest treatise on it has been Patanjali's Yoga Darshan, which to my mind is still one of the most definitive and scientific writings on the control of human thought. Patanjali's book on Yoga Darshan is the oldest book on Yoga. It is believed that Patanjali wrote his book some time in 300 BC. In it Patanjali describes how through the practice of Yoga, thought can be controlled to produce concentration and how this concentrated thought can be used to gain physical and spiritual powers for a person's ultimate enlightenment. The book consists of 195 sutras (Sutra is a Sanskrit word meaning precise maxim) and is divided into four sections. Each section consists of about 40-45 sutras. The first two sections give precise instructions on how to control thought through yogic practice. The third section tells how one gains mastery over natural forces through thought control. This section therefore deals with how a Yogi (person who practices Yoga) can acquire superhuman powers of omniscience, telepathy, clairvoyance, mind reading etc. The last section talks about how with yogic practice and superhuman powers a Yogi can remove the memories of past births and make his/her mind powerful enough to clear it of extraneous impressions so that she can be liberated from the cycle of birth and death. Interestingly enough sage Patanjali does not say how the thought originates and what is the nature of its generation but gives details on how to control it for achieving mastery over natural forces. Recent developments in brain research make it possible to make an attempt to understand thought, mind and consciousness. Generally human thought has been considered by philosophers, religious leaders etc. as nonmaterial in nature. However, a result (thought) produced by a physical brain has to be physical in nature and governed by physical laws. May be these laws are not fully understood presently and hence an attempt is being made to throw light on what these laws could be. Most of the concepts presented are heuristic and intuitive with very little mathematical formulation. There are many studies conducted by scientists all over the world to find out how the brain works. Magnetic resonance imaging (MRI) techniques, which are non-invasive in nature, are normally used in mapping the brain. Recently scientists have started using functional MRI (fMRI) for sharper images. Thus fMRI scans are taken of the brain under different stimuli which show up on the computer screen as maps of blood flow in the brain. Scientists then say that the place of maximum blood flow is the area where thought of a particular nature is generated. They also say that memory of that particular stimulus exists in that part of the brain. However, we are still not sure what the exact location of memory is and there are conflicting theories about whether fMRI really shows all the neuron activities for a particular thought. Besides fMRI may also interfere in the thought process since it produces magnetic field, which is tens of thousands of times stronger than the earth's magnetic field. Nevertheless almost everybody agrees that a thought is produced when the brain neurons fire. How many neurons fire for a single thought nobody knows. We can however make a heuristic statement that firing of neurons produces a structure like a hologram which can be called a thought. Most of the time a fraction of these neurons fire for 'mundane' or every day thoughts such as; what is the color of a shirt, open the door etc. etc. However, for a very deep thought, in which a person may be concentrating on a single subject for a long time, it is quite possible that the whole brain is active and thus close to 100 billion neurons are firing to produce that single thought. The number of neurons firing may also decide how long the brain focuses on a single thought and its intensity. A deep thought in which a person contemplates and reflects on a particular object very intensely and almost goes into a trance-like state is called 'Sanyam' in Patanjali Yoga Darshan. According to Patanjali the whole basis of Yoga is to achieve Sanyam and its use on any object results in its complete knowledge. Interestingly sage Patanjali has devoted 25% of his book on how the deep thought can interact with matter and produce wonderful physical powers for the Yogi. To my mind he is the final word on the control of deep thought and its use to discover Universal Consciousness and hence it will be arrogant on my part to say anything more on it than what Patanjali has already written in his book. We will therefore focus on the structure of deep thought and its production and to point out at appropriate places how this structure and its attributes tally with what Patanjali has written. In order to explain thought, which is a hologram or a geometric structure, we will take help of the concepts of energy-based dissipative structures, chaos theory and synchronization or emergence of spontaneous order. All these concepts show how order is produced from chaos, especially when a large number of variables interact with each other. This interaction produces a geometric structure from seemingly chaotic behavior of these variables. and take the heat from below and dissipate it above to the surface of water. These structures are developed in systems which are far from equilibrium and hence very chaotic, and materialize suddenly when critical conditions are reached. One can extend this analogy and think of Christ, Buddha, Einstein etc. as such structures and that they appear when conditions in the world are favorable (i.e. 'chaotic'). The far from equilibrium condition takes place only when huge amount of information gets embedded in the system. The dissipative structures are like crystallization of information. dynamic systems and has innumerable definitions. I will use the definition given by Edward N. Lorenz (the father of modern chaos theory). He refers to chaos as processes that appear to proceed according to chance and hence are random even though their behavior is in fact determined by precise laws. For example, in the convection of water heated from below, if we sit on a single molecule or a cluster of molecules of water and chart its course as it goes from bottom to top and then comes back down, then we will see the picture as shown in Fig. 1(a). The water molecule is hit by other energetic water molecules and thus its motion is zigzag and very random. If we superimpose this picture on that for the next cycle then it will be like Fig. 1(b). If we do this thousands and millions of times then we develop a structure (or a band) in which the water flows from bottom to top as seen in Fig. 1(c). These are the convection cells. Thus the random motion of these molecules evolves into a structure, as though they are 'attracted' to the band and the structure is called 'attractor'. This is the dissipative structure that we have talked about before. With increase in heating, which results in temperature rise (and ultimately the water comes to a boil), this structure changes shape and hence the water goes up more vigorously and with greater speed. Thus the structure is geometric, energy-dependent and dissipative in nature (dissipates heat) and is a function of the quality and quantity of energy input to it. The seemingly chaotically moving water molecules now have a definite path (convection pattern) in which they move. Both chaos theory and Prigogine's dissipative structures have similar characteristics. They both show that in systems which are far from equilibrium and very chaotic, structures appear suddenly. These structures in the case of water are in four dimensions (three of space and one of time). However, for a very large number of variables (like a billion neurons firing in brain to produce thought), they could be in any number of dimensions greater than or equal to four. But the main thing to remember is that they are energy-driven and dissipative in nature. The emergence of thought is a function of signals from sense organs or stimulation of certain memory space in the brain. However, an entity called 'I' (ego, will, sense of identity, etc.) acts like a symphony director and helps provide the necessary energy to maintain a given thought for a longer time. Besides it also provides coherence to random thoughts emanating from different parts of the brain. We still do not understand how 'I' can influence this process, but just like the conductor who determines which part of the orchestra plays for how long, 'I' decides how long a particular thought will remain in the 'vision' field. This process seems to also exist in most animals. It is called concentration. With practice concentration becomes stronger till a person can make nearly all the 100 billion neurons fire in a laser-like fashion for a long time on a single thought. The ability to concentrate and to keep a single thought on a subject in the "vision" field for a long time is unique to human beings because of our huge brain size and is also governed by the will of a person. Yogis claim that will power is increased by continence. Recent scientific evidence suggests that the brain is full of sexual chemicals and their increased concentration helps in memory enhancement. The desire to save these chemicals could be the basis of celibacy preached in almost all religions. Once the mind cultivates the habit of focusing on a particular thought for a long time, then the neural pathways for other thoughts sublimate and regroup to provide energy for this single thought. Because of the formation of new neural pathways, it is quite possible that earlier memory (Patanjali calls it Sanskar) can be dissolved and new memories can be formed. Patanjali alludes to this concept in his book. Recent scientific evidence also suggests that the adult human brain is pliable and capable of creating new neural pathways and connections. Removal of past memory by Yoga is a mechanism for liberation and a central theme in Patanjali Yoga Darshan. The deep thought has produced the greatest discoveries of this planet. Einstein's relativity theory, Newton's gravitation theory and the truth revelations of Yogis and great spiritual leaders have all come because of deep thought. It is a common utterance among scientists and lay persons that one particular person thought so deeply about a particular problem that Nature revealed her secrets to him. This Sanyam done on any particular idea or object leads to its complete knowledge or mastery over it and ultimately to Samadhi. Deep thought also brings great joy and happiness to a person. The exhilaration that one feels in getting deep knowledge, creating new inventions or discoveries, is beyond any other experience obtained through human endeavor. Deep thought may help stimulate the pituitary gland and produce a sense of happiness. Our brains are somehow wired in such a way that we get a sense of well being when in deep thought. Maybe a union with the truth, super consciousness or God via deep thought is inbuilt in our system. Hence to understand how deep thought is produced and its attributes can help mankind progress towards fulfillment and happiness. fashion to produce a single thought and keep it in the "vision field" for a long time produces a stable structure in a higher dimensional space-time fabric. We still do not know the nature of this space, but can at least conjecture on a general picture of what its attributes are. Our world that we see and feel is four-dimensional (three dimensions of space and one of time). However, theoretical physicists have recently suggested that there could be 10 dimensions of space and one of time to make our universe 11-dimensional. These extra seven dimensions are invoked by cosmologists and physicists in order to relate electromagnetic, nuclear and other forces with the all-pervasive gravity field. Unfortunately we cannot see these higher dimensions but at best can conceptualize them through higher mathematics. Interestingly our present universe has only 4% ordinary matter. The rest 96 % consists of "dark matter" and "dark energy" which we cannot see and know very little about. It is quite possible that this energy and matter may exist in higher dimensional space. An interesting aspect of higher dimensional reality is that a being residing in it will be able to predict events of our four dimensional world since he/she will have a 'better view'. Some yogis get this power through Sanyam. Since Universal Consciousness is even more ancient and pervasive than gravity, it is quite possible that our universe may be multi-dimensional and substantial part of it exists in higher dimensions. It is also possible that the four-dimensional space-time continuum, which we can visualize and feel, could be a 'crystallization' or 'shadow' of multi- dimensional reality. In Bhagwad Gita Lord Krishna showed Arjun the 'Virat' form (Virat means huge) or the birth of cosmos. The description of 'Virat' form is very similar to that of destruction of matter by a black hole! However for Arjun to see this form Lord Krishna gave him a divine vision since with the existing vision it was not possible to show him the multi-dimensional reality. Maybe for us also it might not be possible to see the higher dimensions till we remain in the present four-dimensional world. The four-dimensional space-time continuum is slightly flexible and thus it can be bent by massive bodies. The bending of this continuum results in deflection of light when it passes near these bodies. Einstein predicted this bending of light in his famous paper on General Theory of Relativity published in 1915. This prediction was confirmed experimentally in 1919 by the British physicist Arthur Eddington when he showed that the light from a distant star bent as it passed the sun during the total solar eclipse. As the space dimensions increase and become greater than three, it is possible that the rigidity of space also increases and it is this rigidity that we are interested in looking at for our deep thought. One aspect of this rigid space is that the loss of information from a signal is very little. In the existing four-dimensional space-time world the attenuation of signal is via 1/d2 law i.e. the signal strength reduces from the source by inverse of distance squared. 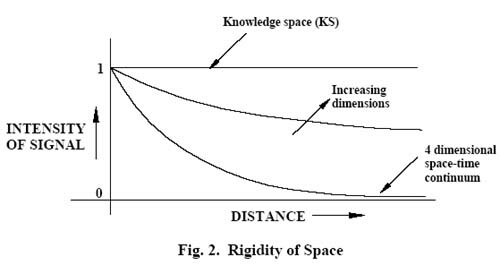 As the space dimensions increase and the space gets rigid the signal attenuation may follow the path as shown in Fig. 2 below. With increasing rigidity the velocity of signal also increases and in higher dimensions it could be many times the velocity of light. Since the signal loss is reduced drastically in higher dimensions, it is possible that this space may contain structures or memories, which are very stable, and thus an information or knowledge structure will remain there forever. I think a deep thought structure, which is geometric in nature, occupies this space. This knowledge space (KS) contains fundamental knowledge produced in the past and is continuously fed by the ever-increasing knowledge from various civilizations. A prepared and focused human mind can access knowledge from this space and I feel that great discoveries of mankind have come from such access. It is also possible that as earth moves around the sun and the solar system revolves around the center of the Milky Way galaxy, periodically we come across KS, which helps the mankind to evolve. Similarly a younger civilization than ours may come across KS developed by us and thus the evolution continues. The movement of earth and the sun around the Milky Way galaxy is time-dependent (it takes about 226 million years for the solar system to make one round of the Milky Way galaxy) and so is earth's encounter with KS. Thus our discoveries are time-dependent and not person-dependent. Any prepared mind encountering the KS at a particular time can get that knowledge. There are many instances in the history of mankind when quite a number of people had similar ideas and thoughts at about the same time. Prepared minds encountering KS react in the same manner. Interestingly this also raises the possibility that there may be knowledge cycles, since the movement of earth in space is cyclic. We are not sure what may be the period of such cycles, but in ancient texts there are references that it may be anywhere from few hundred to tens of thousands of years. Periodic appearance of great souls on this planet earth may be an outcome of these cycles. 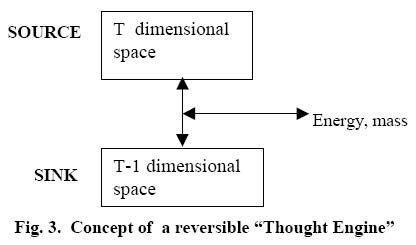 The transformation of one space-dimension to another can take place via a 'thought engine'. 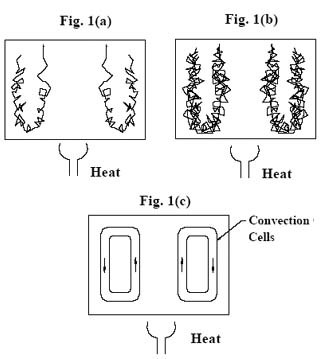 This is similar to a reversible heat-engine, where energy flows from higher temperature (source) to lower temperature (sink) and in doing so the engine produces work. Similarly, in the 'thought-engine' when a certain dimensional space transforms into a lower-dimensional space, energy or mass comes out and by application of these energy and mass, a lower-dimensional space can be transformed into a higher-dimensional space. The transformation from one space-dimension to other is via a quantum jump and hence is not a continuous transition. Fig. 3 below, shows a concept of thought engine. If we take this analogy further, then we can conjecture that at the highest space dimensional transformation, even the time gets sucked in and only space remains. This is a novel concept showing that time can be introduced and removed from the universe and hence the total time in universe is constant. Maybe the final dimension (which we can call 'G') is GOD. Probably it is 'Akash' (Sanskrit word for space) or the final entity as discussed by the ancient Indian philosopher Adi Shankaracharya in his famous book Vivekachudamani. This 'G' space has always existed with no past, present or future. Since time is used (sucked in) for transforming lower dimensions into ultimate 'G' dimensional space, it is equivalent to energy and since it devolves into ultimate space, it may have geometric properties. Thus it is possible that TIME ↔ ?ENERGY ↔ SPACE. Since time is the last thing to devolve, it is possible that our present world may have time dimensions. We are not sure what that dimensional space is. could be a mechanism by which some Yogis claim to produce material from thin air and could also explain the poltergeist phenomenon! It also opens up a possibility of higher dimensional-based form-templates being transformed into matter and hence creation of completely new designs and inventions. Similarly thought engine also provides a mechanism by which personal consciousness is connected to Universal Consciousness since we can reach space 'G' through deep thought. Thus deep thought, matter, space, time and Universal Consciousness are all related. With this relationship it may be possible to find out how we can get Universal knowledge. There are two types of knowledge ' one is incremental and the other is a quantum jump in our understanding of the world and its working. An example of the former is the incremental improvement in chip-making process. A large army of workers all over the world is working step by step in improving the efficiency of this process, so that an increasingly larger number of chips could be put in a small space. Production of a silicon-based transistor by Shockly and his team in early 1950s at the Bell Labs in U.S.A. was an example of quantum jump in knowledge. It allowed mankind to move away from vacuum tube-based diodes to solid state electronics and ushered in the modern computer age. Similarly Einstein's theory of relativity, Darwin's evolutionary theory or Newton's gravitational theory are other examples of quantum jump in our understanding of how our universe is structured. Such quantum jumps in knowledge in any field, whether spiritual, technological or scientific help in mankind's evolution and give a direction and purpose to it. The higher-dimensional thought analysis together with Patanjali Yoga may help us understand how the 'quantum jump' knowledge is perceived by prepared minds. With tremendous focus and concentration, the prepared mind produces a large number of possible solutions to a problem being explored. This churning of information stored in the brain creates a template of information, which is checked continuously with the object of perception. With Sanyam, the mind is able to focus on a particular thought for a very long time till the continuously modified template eventually matches the object in a lock and key-type interaction leading to knowledge. This template or thought packet actively interacts with the object of perception via higher dimensional space and can perceive any knowledge in the universe. Some Yogis have claimed that they can see packets of thoughts as they come to them from external sources. This could be the basis of mind reading capabilities possessed by them. A powerful brain can therefore become a very powerful processor and hence can extract information from weakest of signals, which come as thought packets. Thinking deeply is a two way street. We can send thought packets as well as receive them whenever our minds are anchored to the object of perception. In fact the very act of perception means that the information packets from the object of perception will be received. The same applies to thinking about somebody's mind. Hence one should not think negatively about others even if they have harmed us because the very act of thinking about a negative person brings his/her negativity to our mind. Similarly there are innumerable recorded instances where ordinary people have been able to sense danger or suddenly sense about their loved ones from quite a distance away. We normally call it sixth sense. This could be a mechanism by which intense thought packets concerning the particular person are received by his/her brain and it is forced to process them in a lock and key type arrangement to get the necessary information. It seems somehow that the brain is hardwired more favorably for receiving strong emotional signals from the loved ones. A powerful brain can also become very sensitive to outside signals. Such a sensitive brain can identify itself with any idea or object in the world. For example, once Shri Ramkrishna - a famous Indian saint, while in a heightened state of awareness, identified himself with the grass in the lawn in front of his room and felt a tremendous pain in his chest when he saw somebody walking on the grass. people who come in contact with the enlightened soul and in turn has a cascading effect. Thus the personal evolution towards enlightenment is the best way to transform the world rather than imposing our arrogance and will on a large number of people. It can also be conjectured that as our minds are the products of the same time frame as the Universe, we cannot think beyond what already exists in the Universe. At best we can discover the already existing truths. Even the products of our wildest dreams and imaginations could be the outcome of knowledge and templates, which exists in KS somewhere in the Universe. A powerful mind helps us to discover it. Deep thought and gravity are both geometric in nature and hence it is possible that they may be related. Thus deep thought may bend the space-time continuum similar to that done by gravitational mass. This interaction might take place in higher dimensional space. As we have seen that mass is produced and annihilated via a thought-engine during transformation of spaces, hence it is possible that deep thought and gravity are related at a deeper level. There is a large body of psychokinesis data from all over the world attesting to the interaction of mind and matter. Thus production of materials from thin air, changes in materials by application of thought only, levitation etc. have been reported by people throughout the ages and from all different civilizations. Patanjali Yoga Darshan states that with Sanyam on various objects, a Yogi gets power to master nature so that he can fly, become invisible, move objects by thought and make the human body a very powerful instrument for knowledge gain. All these things can take place only when deep thought and matter are interrelated and hence can interact. Deep thought is a product of almost 100 billion neurons firing in a laser-like fashion. Similarly it may be possible that gravity manifests only when a very large number of particles are involved. Both gravity and deep thought therefore involve large-number mathematics. The exact nature of how it takes place is not known. We can only measure gravity with masses of order of milligrams. According to physicists below this mass it is extremely difficult to measure gravity since gravitational forces are too weak in this range. Nevertheless even a milligram of substance contains billions and billions of atoms and it is possible that these large numbers produce (possibly through the movement of electrons and atoms, etc.) a signature called gravity. This concept is very conjectural in nature. However, it is quite possible that movement produces the necessary structure which could be either thought (firing of neurons) or gravity (movement of electrons etc.). Movement is an outcome of time. Without time there is no movement and ultimately everything devolves into 'G' space. There are many instances in Indian Yogic tradition where highly evolved Yogis and enlightened individuals have left their body with full knowledge of conjunction of planets and stars. Thus in Mahabharata it is mentioned that Bhishma Pitamah left his body during 'Uttarayan' or when the sun was closest to earth in winter. Similarly Vivekananda and Shri Ramakrishna - two great Yogis of India in the 19th Century left their body by will, after detailed understanding of planets' conjunction through the almanac. In ancient Indian text of 'Brahma Sutra', it is stated that the soul guided by Sun's gravity reaches space called heaven. Apparently the ancients knew about the effect of gravity on soul and deep thought. Similarly it can be conjectured that the Egyptians built the massive pyramids, not only to bury their kings or queens but they also acted as gravity antennas. The biggest Giza pyramid is estimated to weigh 6 million tons and the King's and Queen's burial chambers are close to and equidistant from the center of gravity of the pyramid. It is quite possible that the ancient Egyptians understood that localized gravity may help the passage of soul through intergalactic space. Alternatively it is also possible that Egyptians thought that a pyramid may act as an antenna for deep thought or universal consciousness to help resurrect the King and the Queen ! I feel the same laws may have been used by the Yogis when they meditated inside deep caves in mountains. The mountains could have acted as antennas for reception of universal knowledge. planet. The molecules of a certain size became 'living' when they resonated with the gravitational field of the earth. It is quite possible that at this juncture the concept of time also got embedded in the "living" systems. These could be the 'critical size' molecules, which were essential for evolution of life. We do not know what this critical size was. These molecules effectively became gravity antennas. In nature all the forces acting on a living entity help in its evolution. Gravity forces are the largest force acting on any organism on this planet earth. Hence it is quite possible that gravity helped in life's evolution. It may be interesting to test this hypothesis by taking the 'critical size' molecules in the zero gravity environment of outer space and to see whether they replicate and transfer the genetic information-the basic prerequisite for life. The interaction of deep thought and gravity can also be seen in the interaction of alpha waves and earth. Alpha waves are produced in the brain when we are in meditation or relaxing. These waves are generally in the range of 8-12 Hz frequency. The earth diameter (~12,800 km) is such that it can have a standing half-wave of 11.7 Hz (very close to 12 Hz). Is it therefore possible that our brain evolved in such a manner that the earth's geometry influenced the alpha wave production? Incidentally scientists have also discovered that before major earthquakes an electromagnetic wave of 0.01-10 Hz comes from deep inside the earth. In some other habitable planet the living beings may have different alpha waves depending on the geometric shape and size of that planet. Similarly life on other planets may evolve according to their gravity field. Interestingly enough the relationship between alpha waves and earth's geometry may have other implications. Practitioners of Bhakti Yoga and Buddhist traditions have always stressed the need to allow full flow of thought waves without any interference from ego or sense of identity ' I ' for achieving samadhi. Bhakti Yoga says that one should completely sublimate ' I ' by abandoning oneself to God or Universal consciousness. Similarly Buddhist lamas of Tibet suggest that one should try to relax so that the ego stops interfering in thought production. I feel both these practitioners are intuitively trying to allow the mind to follow the alpha wave pattern. Thus when mind gets tuned to the gravitational field of the earth, meditation and samadhi result. Our present science is based on reductionist principles. We believe that once we find the basic building block then we can construct the whole universe around it. Thus the physicists all over the world are building bigger and bigger atom smashing machines to smash the matter and discover that ever elusive building block. I feel we are looking at the wrong end of spectrum. Interaction of large number of variables producing their unique signatures may provide a mechanism to link all the various forces of nature. Hence our thesis of deep thought and its relationship with time, mass, space, universal consciousness and knowledge maybe a step in the right direction. A detailed mathematical formulation may however be necessary to put it on a firm footing. Thanks. You can buy the book from which this article is taken. http://www.nariphaltan.org/thoughtbook.htmbrbrAll the best.